With new, and ever larger flowering varieties being released each year, it's no wonder that Hydrangea species and cultivars are so popular. Unfortunately, owning one of these fancy specimens can come at a price - which is normally expensive! 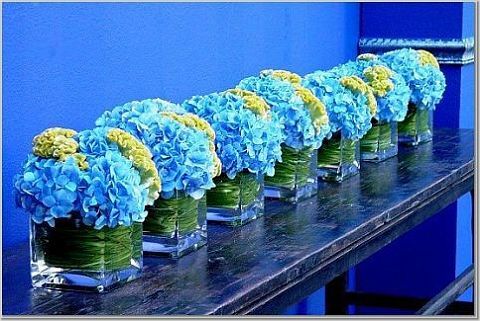 Luckily, Hydrangeas are very easy to propagate and cuttings can be taken at more or less any time of the year so long as the plant is actively growing. In fact, if your Hydrangea cuttings are taken over the summer, they will root in a matter of weeks! And it couldn't be easier, simply cut off a shoot making sure that your knife is sharp and that the cut made is clean and even. To begin with, remove a section of new growth 5 to 6 inches long with your sharp knife. You can recognize the new stem growth on a hydrangea as it will be a light green. Remove the lower leaves at the bottom two leaf nodes. This is where the root should form. 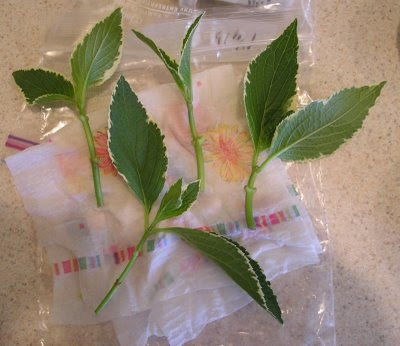 Remove all leaves except for the two at the top, then cut these top leaves in half crosswise. Dip the base of the cutting stems into a rooting hormone to help encourage root growth. Follow the directions on the manufacturer's label for correct usage. 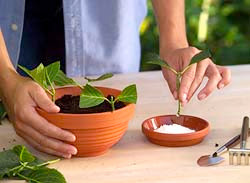 Place each stem into a separate pots containing a well drained potting compost such as John Innes 'Seed and Potting'. However it is well worth improving the drainage further by creating a 2:1 mix of compost and horticultural grit/perlite. Water the pots until the water runs freely from the drainage holes. The soil should now be moist but not soggy. If you only have large pots at your disposal then you can place more than one per pot, but they will need to be potted on at a later date. Once the pots have drained, place them into a covered propagator or - failing that - cover the pots with plastic bags. Make sure the leaves do not touch the plastic. Leave the cuttings in a shaded location, and only when the soil is dry. The cuttings should root between two to four weeks. Place cuttings in bright light, but never in direct sun as they can overheat and die. Do not water the cuttings until top of soil feels dry to the touch. Remember though that over watering will cause cuttings to rot. Overwinter Hydrangea cuttings under protection as they are unlikely to survive extreme temperatures in their first year.